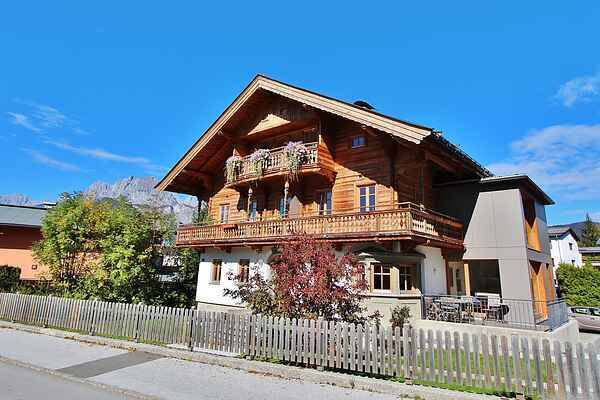 Charm, character and dependability - this apartment in a modern yet cosy country house style is located on the ground floor of the freshly renovated "Villa Grete", a Wilhelminian villa in St. Johann in Tyrol. The open-plan living area with a sunny reading area and inviting layout, a massive oak table (10 people) in the spacious conservatory, the modern and fully equipped kitchen, 3 bedrooms, 3 bathrooms and a generously sized vestibule offer 121 m2 of space, plenty of room to feel at home and enjoy your stay. The terrace, which is sheltered from the wind and has direct access to the dining room, offers a place in the sun. You'll find Tyrolean charm and leisure in the mountains in the Schneewinkel ski area, right at your doorstep, or in nearby Kitzbühel. Hiking in the Kaisergebirge and relaxing in the Kaiserbachtal thanks to our accommodation's central location, you have many different daytrip destinations to choose from in any season. If you love nature and the beautiful Tyrolean mountains then we look forward to welcoming you here.